A lot of new gear at the Earthquaker Devices booth with the Spatial Delivery, Night Wire and many more, all demoed on their Sound Projector 25 amp. JHS has introduces The Crayon, its new "Direct-In Distortion"-style fuzz pedal. Keeley Electronics presents limited editions of its Psi fuzz and Abbey Chamber Verb effect pedals. Summer NAMM visitors could discover this year the young Ogre Korean manufacturer of effect pedals and instruments. Catalinbread announces the availability of two of the new effect pedals that were introduced at NAMM 2015, the Antichton and Talisman. 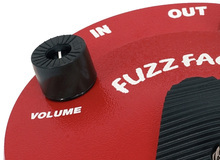 Suhr added an octave-up effect to its Rufus fuzz pedal for guitar and thus launches the Rufus Reloaded model. That’s probably what was missing to make the iconic Electro-Harmonix fuzz pedal the perfect effect, and that’s what Molten Voltage has done. Mod Kits DIY introduces the second generation of The Contortionist fuzz pedal for guitar.